Alan King admitted he was 'surprised' to see Medinas spring a surprise and give the trainer a one-two in the Coral Cup after Wayne Hutchinson's mount got the better of stablemate Meister Eckhart by two lengths. 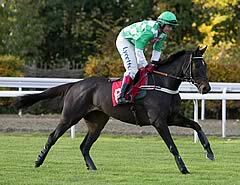 The winner was the outsider of the King-trained pair but stable jockey Hutchinson had the choice and decided to ride the 33/1 shot instead of the 14/1 runner-up and his faith was justified as the six-year-old stormed up the hill to record his second successive victory. "It has been a long time coming. I have forgotten how it feels to have a winner here but it's marvellous to have the first and second," said King. "We fancied the runner-up a bit more but to be fair to Wayne (Hutchinson), he was adamant he wanted to be on this one but I thought he'd gone up a bit too much in the handicap following his last win. "I have been complaining at the handicapper all season for putting Medinas up and up but he incredibly tough and I am thrilled with the pair of them. "He's such a tough horse and it was great to see him run up the hill like that. He genuinely doesn't know when he's beaten and it's nice to see a horse progress like this and land a decent prize. "I always thought they were going too quick up front and full marks to Meister Eckhart because he has kept on nicely after always being prominent. He's going to be a really exciting prospect next year so we're looking forward to that. "We've not had the greatest season - I have made no secret of that - and I've had a few blanks at The Festival over the years so this win will give the whole yard a massive boost. Most of my big guns have gone wrong and if I do have a winner here, it tends to be in the novice hurdles or chases. "The stable staff work so hard throughout the year and it's onwards and upwards." Medinas was King's 13th winner at The Festival. Medinas gave jockey Wayne Hutchinson his second Cheltenham Festival winner, after Oh Crick in the Grand Annual Chase four years ago. The six-year-old, a 33/1 shot, beat his better-fancied Alan King stablemate Meister Eckhart, 14/1, by two lengths in the Coral Cup. One of the first to congratulate Hutchinson was the stable's injured number one rider, Robert Thornton. "It's gutting for him to miss the Festival," said Hutchinson, "but he'd have been on the second in this race, so he didn't mind too much this time." Hutchinson chose to stick to Medinas, on whom he had won the Welsh Champion Hurdle last month. "I thought he had all the qualities for a Cheltenham handicap," he said. "He's tough and he stays. They went off hard enough in front and that played to his strengths. He jumped well all the way, and though coming down the hill I thought he'd finish third at best - I thought at that stage our other one would win - once mine turned in and hit the rising ground he found plenty, as I'd hoped he might. He battled great all the way to the line." French-bred Medinas is owned by retired businessman Frank Bell and his wife Hilda, both from Northern Ireland. "It's great for the yard, and everyone who works there to have first and second," said Bell. "But I'm thrilled it was us who was first. Medinas has given us such fun. He has such tenacity and he deserves this." Willie Mullins is not winning every race at this year's Cheltenham Festival, but even in defeat it is hard not to compliment him on a fine piece of training. Witness Fiveforthree, who finished third in the Coral Cup after an absence of no less than 727 days. Ridden by Paul Townend, the lightly-raced and fragile 11-year-old was beaten a nose by runner-up Meister Eckhart, and with a bit more match practice you suspect that result may have been reversed. Fiveforthree races for the Olde Crowbars Syndicate, a seven-strong group that takes its name from a Dublin-based rugby club. Spokesman Michael Hilary said: "After an absence of two years that was fabulous. The last time he ran was here in the 2011 [Ladbrokes] World Hurdle and he could have done with a run today, because he just showed that little lack of match practice. "We're so excited because he's back, and still a young-at-heart horse, and now we'll look forward to Punchestown. We hope he stays sound over the next six weeks. "He drifted out to 20/1 today and we backed him and have a good bit of prize money, too, so we have to be happy. When we bought him they said he could go right to the top, but he proved rather fragile. "He gets his name from a score in golf, while the Crowbars is a Dublin rugby club that was formed from the Wanderers. They weren't allowed to play on a Sunday being a protestant club, so a guy set up a club within a club and that was the Crowbars." Mullins said: "He jumped fantastic, and the handicapper gave him a great chance. It nearly came off." The Coral Cup is one of the newer contests at The Festival, having been introduced in 1993, but is well established as one of the season’s most competitive handicaps. The first winner, Olympian, picked up a £50,000 bonus having won the Imperial Cup at Sandown Park the previous weekend. The bonus was put up by Sunderlands, bookmaking sponsor of the Imperial Cup, to any horse that won the Sandown race and went on to success in any contest at The Festival. Paddy Power, the Imperial Cup’s current sponsor, is offering a £75,000 bonus to any horse that completes the double this year. 30 horses lined up in 1994, 1995, 1999 and 2006, although the current safety limit is 28. The smallest field of 21 went to post in 1993 and 1998. 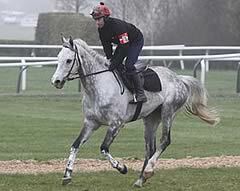 Sky’s The Limit carried 11st 12lb to victory in 2006, while Burntoakboy had 9st 12lb on his back (including Sam Jones’ 5lb claim) when winning in 2007. Martin Pipe is the leading trainer in the contest, having scored three times with Olympian (1993), Big Strand (1997) and Ilnamar (2002). Among current trainers, Edward O’Grady (Time For A Run 1994 & Sky’s The Limit 2006) and Philip Hobbs (What’s Up Boys 2000 & Monkerhostin 2004) lead the way. Barry Geraghty and Davy Russell have the best records of jockeys. The former won aboard Sky’s The Limit (2006) and Spirit River (2010), while the latter was successful on Naiad Du Misselot (2008) and Carlito Brigante in 2011. Both What’s Up Boys (2000) and Idole First (2005) scored at 33/1 and they are the longest-priced winners, while Olympian (1993) and Xenophon (2003) were successful at 4/1, the shortest-priced scorers, and they are also the only two favourites to have obliged. The 2008 winner Naiad Du Misselot was the first Festival scorer to succeed by the then recently-introduced new distance of a nose. The fastest time in the 18 runnings was set in 2000 by What’s Up Boys, who scored in 4m 53.8s, beating the previous best of 4m 57.0s set by Big Strand in 1997.